Breathtaking beauty, ecological wonder, and sports fishing paradise are all ways to describe the unparalleled appeal of Haida Gwaii (also known as the Queen Charlotte Islands). This sleepy region is known for its combination of first class fishing and a pace of life pined for by many, attracting visitors from around the globe every year. With limited private land on the islands, owning property in this remarkable oasis is rare. NIHO’s Naikoon Estates Phase II, has made it possible to own a piece of this coastal rainforest, either for investment or to create your own unique hideaway.These lots all have river frontage on the Sangan River, widely considered one of the best salmon producing rivers in British Columbia. Species like Chum and Coho Salmon, Cutthroat Trout,Dolly Varden, Pink Salmon, Staghorn Sculpin, and Steelhead are all present in the Sangan, and fly fishers of all types come out to try their luck against these feisty fish.Only minutes away are the year-round recreational opportunities found on North Beach. The beach between the sand dunes and the ocean is wide and very flat and flat enough to drive a car on. You can stand on the beach and look in either direction at miles of beautiful beach as far as the eye can see. On a clear day, a majestic view of Alaska can be seen in the distance. Don’t miss your opportunity to own a piece of recreational paradise. With 355 ft of river frontage on the spectacular Sangan River, this 16.38 acres offers you private access to the fishing that attracts repeat visitors from all over the globe. Less than a 15 minute drive to the marina at Masset and only seconds away from North Beach, this is an excellent spot for a fisherman’s get-a-way. Sitting at the highest elevation within Naikoon Estates, Lot 4 gives you amazing views of the surrounding countryside. Relax among the old-growth spruce or match wits with the feisty fish from the 355 ft of Sangan River frontage running through your backyard. With over 17 acres at your disposal, this is a recreational paradise. 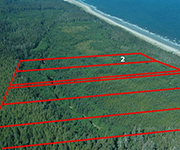 Lot 1 of Naikoon Estates Phase II on Haida Gwaii features the lush wonders of a coastal rainforest. 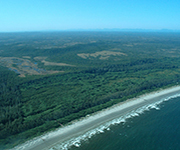 This 23.57 acre property provides you with a home base for a multitude of recreational opportunities along its 604 ft feet of river frontage or nearby North Beach. 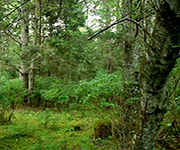 This 15.12 acreage on magical Haida Gwaii is your opportunity to own a private lot within Naikoon Provincial Park. Lush rainforest is divided by 356 ft of riverfront on the Sangan River, a fly-fisherman’s dream. 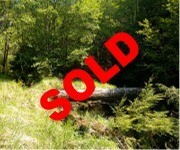 Recreational property like this won’t be available for long. The largest lot in Naikoon Estates Phase II, this 30.91 acre mystical oasis offers you a home base to explore the many wonders in the area. Whether you are interested in trekking in the old-growth rainforest or using your 508 ft of riverfront on the Sangan River to reel in your dream catch, there is something for everyone.